One of the most talked-about Star Wars items to debut at New York Toy Fair was HasLab's massive four-foot-long recreation of Jabba's Sail Barge, The Khetanna, as featured in the opening of Return of the Jedi. The impressive piece of the Vintage Collection will set you back $499.99, but the company has turned to crowdfunding to see if there's enough interest to move forward with the massive piece of memorabilia. 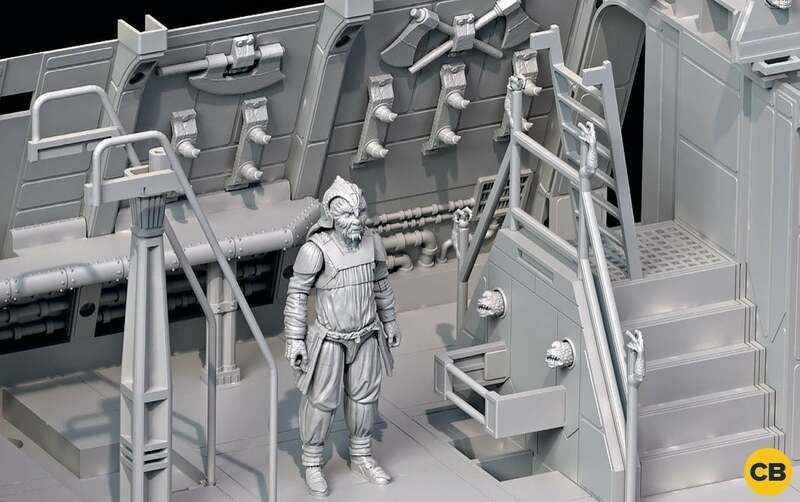 Not only will the backers receive the astonishing item, but you'll also get Behind the Workbench, "a premium, 64-page booklet, that goes behind the scenes of the design and development of the actual Sail Barge film set piece and Hasbro toy. Complete with set photos, product blueprints, interviews, and more." Scroll down to get an exclusive first-look at the booklet and head to Hasbrolab.com to order yours today! "Measuring approximately 4ft long, this vast vehicle is a dream item for any Star Wars collection," the site reads. "Designed to captivate and inspire, The Vintage Collection Jabba's Sail Barge (The Khetanna) features exquisitely detailed, fan accessible decks that complement 3.75-inch figures (not included) allowing fans and collectors to recreate intense battles in the Star Wars saga. Its removable side panels also offer a unique opportunity to pose and set up incredible dioramas. Complete with premium deco, vintage packaging, and soft cloth sails, this dream product offers Star Wars devotees the quality and realism they know and love. Included with the vehicle is Jabba the Hutt (3.75-inch scale figure)." "As the layout evolved, it became apparent that the original 'solid' bulkhead designs divided the interior into 'sealed' compartments - a configuration not conducive to figure interaction," the booklet reads. "The revised bulkhead designs allowed for better 'traffic flow.' The interior length of the vehicle could now be accessed." It continues, "Redesigning the bulkheads opened up the opportunity to create new theme-appropriate interior areas. A fully developed, two-place cockpit, prisoner cell with shackles, sliding cell door and trap door, galley kitchen, and armory were among the additions." "In our design, we have tried to be faithful to what people have already seen and ideated about these spaces, while also adding things that seemed appropriate to the scene," the booklet describes. "Mark Boudreaux, for example, collaborated with the design team to add weapons and horn tracks on the wall of this room in a decorative nod to Jabba's Gamorrean warriors. "The reference illustrations we started with show a dashboard that goes around and monitor screens, but it is all very basic. 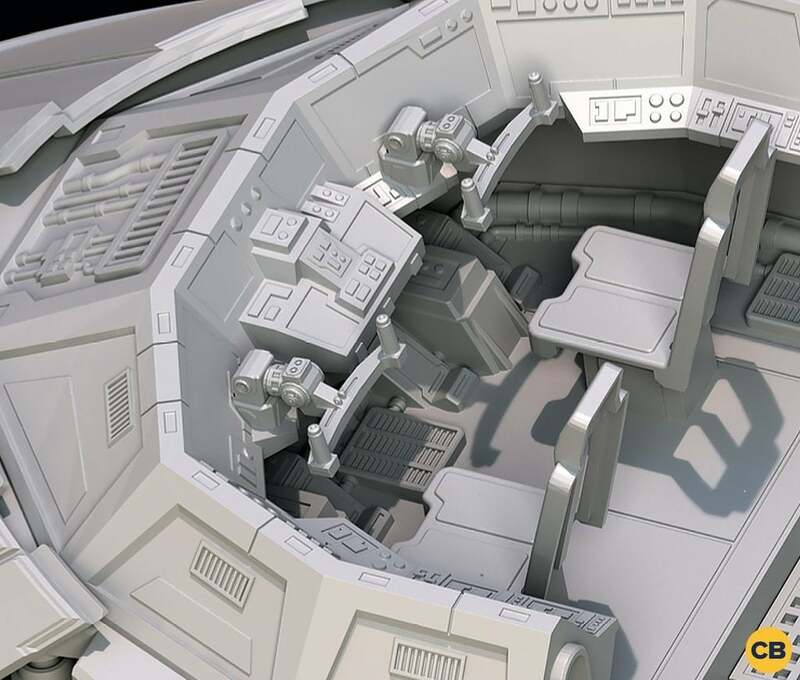 There is enough information to distinguish that it is a cockpit, but for the detail we need in the plastic components of the vehicle, Mark Boudreaux and team relied heavily on reference materials and inspiration from the set, " the booklet notes. "They added controls, steering columns, vents, piping, pedals, and all kinds of visual cues that run throughout the ship, all in an attempt to remain faithful to the lore as well as the actual mechanics of a ship of the Khetenna's size and esteem." "While it was a huge challenge for the design team to make sure they accommodated all of the structural demands of Jabba's sail barge, it was also a challenge to fill out the space with interior elements not shown in the films or blueprints," the booklet chronicles. "One challenge that design faced right away was the staircase/ladder shown here. 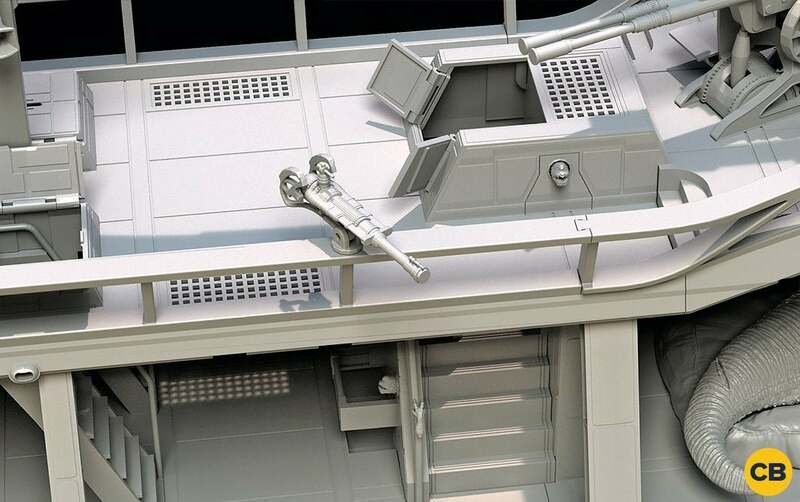 In the original Lucasfilm designs, there was a staircase from top to bottom; however, when our team looked at the dimensions, we realized that a ladder was far more feasible and would offer much more space to move around the interior of the ship." Possibly the only thing more shocking than Jabba's flair for extravagance is his ruthlessness, having no problem pitting his foes against a rancor or, even worse, be left to completely rot in his prison. "From an attention-to-detail perspective, we wanted to really think about the small spaces as well as the large," the booklet notes. "What could one find in the shadows of the barge? 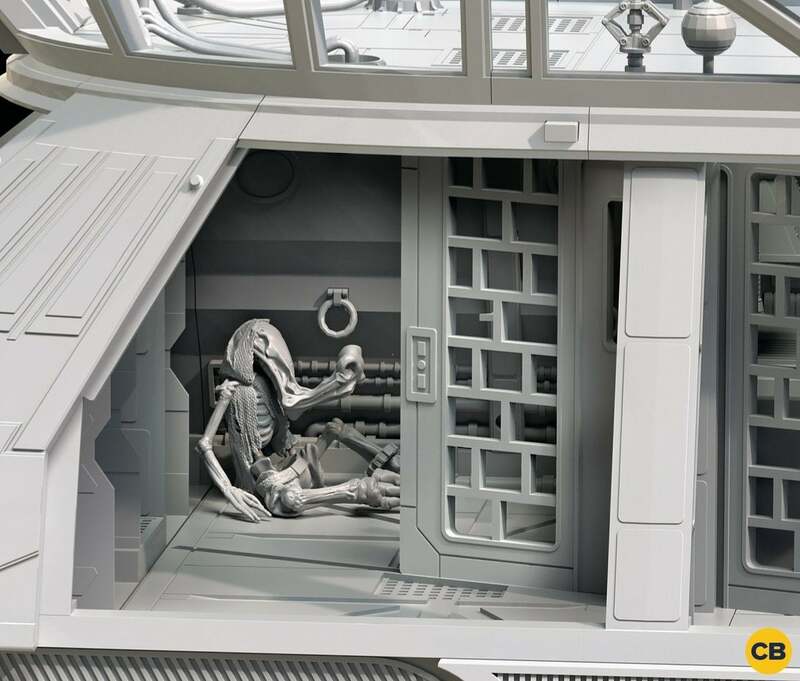 As a nod to Jabba's notorious disregard for prisoners, we included a skeletal prisoner in our jail cell CAD images." From the looks of the skeleton, it appears as though an ithorian got on the gangster's bad side. E. Kick back in Jabba's Lounge, finished with ornate details including wall mounted trophy heads"
K. Operational shutters in Jabba's Lounge help to minimize distractions and protect from glares of the blazing twin suns of Tatooine"
Head to Hasbrolabs.com to back this project now! We hope you enjoyed the full breakdown of what was included, so now take a look at how the pages will look in the booklet itself!